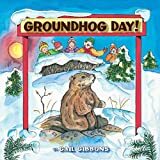 On February 2, 1887 (or 1886), the first Groundhog Day celebration took place in Punxsutawney, Pennsylvania, and such celebrations have been taking place over and over again ever since (on each February 2nd)! Newsflash: On February 2, 2019, Phil gave a grateful nation a prediction of an early Spring for 2019! By failing to see his shadow, the famous rodent gave some welcome news to a country digging out from an epic cold snap. Thanks Phil! Digging deeper, we find Pennsylvania largely settled by people of German descent, often referred to incorrectly as the Pennsylvania Dutch (probably from “Deutsche,” the German word for German.). Diagram indicating Pennsylvania Dutch (Pennsylvania German) settlement in the United States. These German-Americans started a modified form of using an animal to predict the coming of Spring, in this case the noble groundhog. In Europe, people had used other critters such as badgers in a manner similar to our version of Groundhog Day. Groundhogs, also known as woodchucks, marmots or whistle pigs, are actually a large member of the ground squirrel family, which means of course they are rodents. Although people have always hunted them in the United States, either for food or because of the holes they dig (in which a horse or cow can break a leg if the hole is stepped in), nobody is going to hunt Punxsutawney Phil, the star of Groundhog Day and a national celebrity! Indeed, Phil is considered the sixth “Most Famous Animal in History“! If Phil exits his burrow on February 2nd and sees his shadow, you can expect another 6 weeks of winter weather. (Not really an amazing prediction if you consider the actual winter season goes about 6 weeks after Groundhog Day anyway!) If Phil does not see his shadow, the coming of Spring will be early that year, or so the legend goes. 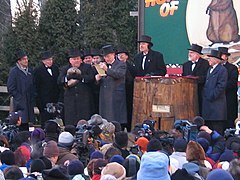 Although Pennsylvania has the original and most famous groundhog, other cities and states also observe Groundhog Day festivities and have their own celebrity groundhog, like Buckeye Chuck in Ohio. Perhaps the most famous cultural reference to this event is the 1993 movie Groundhog Day starring Bill Murray. In this film, Murray lives the same day (February 2nd) over and over and over, until he learns his lesson and becomes a better person. 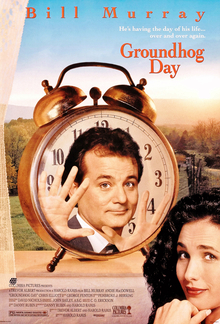 The film had enough social impact that the words “Groundhog Day” have come to mean “same old, same old, over and over again.” Other movies, stories, cartoons and television shows have made reference to Groundhog Day as well, although the Bill Murray movie remains the most well-known popular culture reference to this particular February tradition. A bizarre thing about the Groundhog Day movie is that although it is set in Punxsutawney, Pennsylvania, it was actually filmed in Woodstock, Illinois! Something else you may or may not find to be bizarre is all of the strange and somewhat humorous edits people have made over the years to the Wikipedia article on groundhogs. Question for students: Do you believe that the groundhog made the correct prediction this year? Please let us know in the comments section below. Whether you do or do not, we wish you a Happy Groundhog Day! Gibbons, Gail. Groundhog Day! Holiday House, 2007. Herrington, Lisa M. Groundhog Day (Rookie Read-About Holidays). Childrens Pr, 2013. The featured image in this article, a photograph taken on 26 April 2014 by Ron Shawley of Punxsutawney, Pennsylvania from https://www.panoramio.com/photo/106402124, is licensed under the Creative Commons Attribution 3.0 Unported license. This image, which was originally posted to Panoramio, was automatically reviewed on 6 April 2017 by Panoramio upload bot, who confirmed that it was available on Panoramio under the above license on that date.